Seaventures Dive Rig is pleased to announce that we are now proud member of Green Fins Malaysia. What is Green Fins I hear you ask? 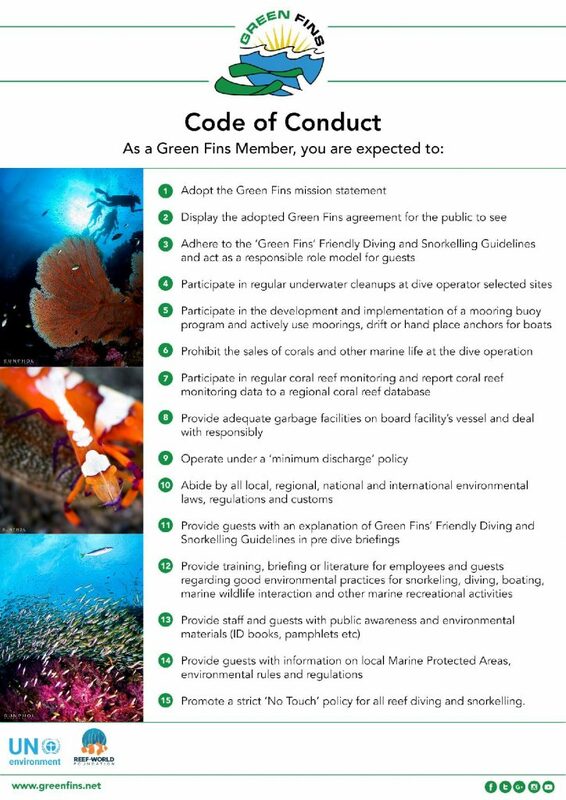 Well, Green Fins is an organisation that promotes public awareness and management practices that will benefit the conservation of coral reefs and reduce unsustainable tourism practices. 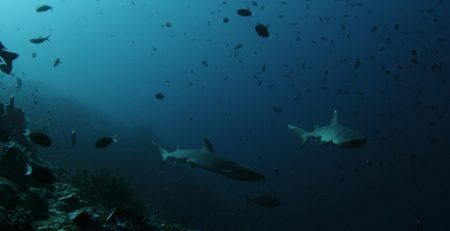 They are based all over South East Asia and work directly with dive centers, snorkel operators, local communities and governments to help them reduce their environmental impact. How ​did we become a Green Fins Member? Well first we had to sign up​, adhere to and be assessed on a 15 point Code of Conduct as shown below. We ​have ​committed​to uphold al​l of the points of the C​ode of Conduct and in turn, ​Green Fins Malaysia assessors will come to the rig and make an annual assessment to ensure ​that ​we are sticking to our promises. Our first assessment went ​really well​, where we received a high score​ and were accepted into the ​Green Fins family. You can now find us listed on the green fins website at: http://www.greenfins.net/en/location/malaysia/sabah/mabul-mataking-pom-pom. Our membership application to Green Fins has been part of a bigger plan​. W​e ​are ​already fortunate to dive at one of the best dive sites in the world – Sipadan – and we ​are striving to make Seaventures Dive Rig ​one of the best dive resorts in the world, that operat​es in the most environmentally friendly and sustainable way possible. 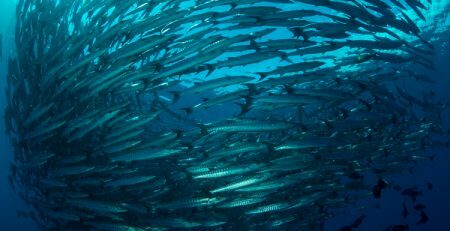 But we also want to lead positive change in the area of marine conservation. On any week you can find the dive team making regular underwater cleanup dives, participating in coral reef restoration​, and using their knowledge and experience to educate and inspire other divers to make positive changes. ​What else are we doing? We have introduced environmentally safe hand soap and cleaning chemicals across the rig. We are reducing ​our usage of​ ​single-use ​plastic ​a​cross the rig. For example, this year we have changed to providing re-fillable glass water bottles in guest bedrooms as opposed to disposable plastic ones. ​Our dive team teach several Project A​WARE​ courses about Marine Debris and Shark Conservation. And ​we have certified many of the dive team as Reef ​Check Malaysia ‘Eco Divers’. This means that they can assess the health of coral reefs across Malaysia. All of our dive briefings include an environmental awareness section. ​F​inally​, we have been working hard under the water to improve our house reef​, including planting a coral nursery with its ability to sustain plenty of life.